President Trump signed the order on June 30 to reestablish the National Space Council to offer badly needed expert guidance to move #NASA and our space program forwards--to actually set America on course for the Moon, Mars and beyond. 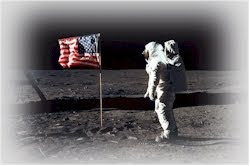 Apollo 11 astronaut Buzz Aldrin joined the president in the signing ceremony, just weeks before the 48th anniversary of Apollo 11's landing on the Moon. Vice President Pence will be the chairman of the Council, and will make a statement on space policy on July 6 at the Kennedy Space Center. Thank you very much to our great Vice President and also for the fantastic job that Mike has been doing. The future of American space leadership -- we're going to lead again. It’s been a long time. It’s over 25 years, and we're opening up, and we are going to be leading again like we've never led before. We’re a nation of pioneers, and the next great American frontier is space. And we never completed -- we started, but we never completed. We stopped. But now we start again. And we have tremendous spirit, and we're going to have tremendous spirit from the private sector -- maybe in particular from the private sector. Today, we’re taking a crucial step to secure America’s future in space by reviving the National Space Council after it has been dormant almost 25 years if you can believe it. 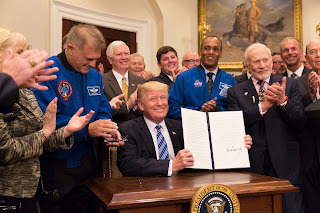 During the campaign, Vice President Pence promised that our administration -- because Mike is very much into space -- would revive the National Space Council, and with this executive order, we’re keeping that promise. I used to say, what happened? Why aren’t we moving forward? Today’s announcement sends a clear signal to the world that we are restoring America’s proud legacy of leadership in space. Our Vice President cares very deeply about space policy, and for good reason -- space exploration is not only essential to our character as a nation, but also our economy and our great nation’s security. Our travels beyond the Earth propel scientific discoveries that improve our lives in countless ways here, right here, at home: powering vast new industry, spurring incredible new technology, and providing the space security we need to protect the American people. And security is going to be a very big factor with respect to space and space exploration. At some point in the future, we’re going to look back and say how did we do it without space? The Vice President will serve as the council’s chair. Several representatives of my administration will join him including the Secretaries of State, Defense, Commerce, Transportation, and Homeland Security; the Chairman of the great -- I’ll tell you, he’s doing a fantastic job, always working, always fighting, and winning -- winning big against ISIS, that I can tell you, seeing what’s happening there -- the Chairman of the Joint Chiefs of Staff, the National Security Advisor, NASA, and the Director of National Intelligence. The council will also draw the expertise of other White House offices as well as insights from scientists, innovators, and business leaders from across the country. Many business leaders that want to be a big part of this. I think the privatization of certain aspects is going to play a very crucial role, don’t you think? They are truly into it. This coordination will be accomplished through an advisory group that is being convened by today’s executive order, which I’ll be signing in a minute. The National Space Council will be a central hub guiding space policy within the administration. And I will draw on it for advice and information and recommendations for action. And the Vice President, myself, and a few others are going to pick some private people to be on the board. I will say that’s not easy because everybody wants to be on this board. People that you wouldn’t have believed loved what we’re doing so much they want to -- some of the most successful people in the world want to be on this board. The human soul yearns for discovery. By unlocking the mysteries of the universe, we unlock truths within ourselves. That’s true. Our journey into space will not only make us stronger and more prosperous, but will unite us behind grand ambitions and bring us all closer together. Wouldn’t that be nice? Can you believe that space is going to do that? I thought politics would do that. (Laughter.) Well, we’ll have to rely on space instead. Every launch into the skies is another step forward toward a future where our differences seem small against the vast expanse of our common humanity. Sometimes you have to view things from a distance in order to see the real truth. It is America’s destiny to be at the forefront of humanity’s eternal quest for knowledge and to be the leader amongst nations on our adventure into the great unknown. And I could say the great and very beautiful unknown. Nothing more beautiful. With the actions we are launching today, America will think big once again. Important words: Think big. We haven’t been thinking so big for a long time, but we’re thinking big again as a county. We will inspire millions of children to carry on this proud tradition of American space leadership -- and they’re excited -- and to never stop wondering, hoping, and dreaming about what lies beyond the stars. “I am pleased that President Trump has signed an executive order reestablishing the National Space Council. The council existed previously from 1989-1993, and a version of it also existed as the National Aeronautics and Space Council from 1958-1973. As such, the council has guided NASA from our earliest days and can help us achieve the many ambitious... milestones we are striving for today. “This high-level group advises the president and comprises the leaders of government agencies with a stake in space, including the NASA administrator, the Secretaries of State, Commerce, Defense, and others, and will be chaired by Vice President Mike Pence. It will help ensure that all aspects of the nation’s space power -- national security, commerce, international relations, exploration, and science, are coordinated and aligned to best serve the American people. A Users’ Advisory Group also will be convened so that the interests of industries and other non-federal entities are represented.